Senior Jacob Campbell enjoys spending time in the cafeteria with his fellow football teammates after morning workouts. "Since we’ve got zero hour in the mornings, so a lot of people don’t eat before going to school, because working out after eating is not good, so we go to breakfast [in the cafeteria]," Campbell said. 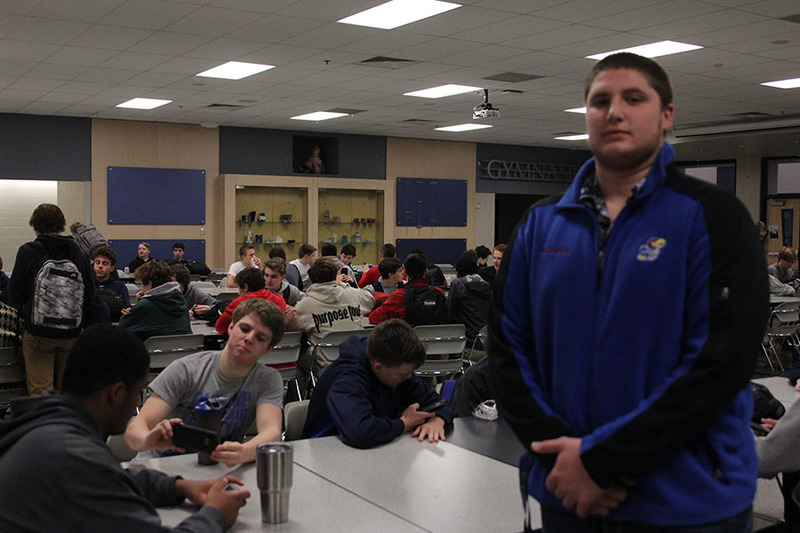 When students walk into the cafeteria in the morning, it is almost certain they will see senior Jake Campbell and other football players sitting at one of the tables.This is because of zero hour, a before school weights training program the football team participates in every morning all school year. The players are finished with zero hour around 7:15 every morning, so they are usually the first ones in the cafeteria. Campbell has been sitting there in the mornings since he was a freshman, and according to him, the tradition was started years ago by seniors. For Campbell, sitting in the cafeteria every morning gives him an opportunity to spend time with his friends on the football team. On the average day, the table is full of exuberant boys eating breakfast and getting ready to start the school day. Campbell believes this strengthens the team’s overall bond. According to sophomore Eli Midyett, a football player who sits with Campbell in the cafeteria every morning, the tradition began naturally and soon became routine. “I don’t think it happened on purpose, we hang out together a lot, so we just started sitting together after we work out,” Midyett said. Sitting together everyday has allowed Campbell to get to know each teammate better, and according to him this has caused the team to get better. He believes being able to sit together every morning in a specific area helps bond the players, which ultimately helps the team.